German Chancellor Angela Merkel has visited Hungary for festivities marking the 20th anniversary of the opening of its borders to the non-communist West. The decision paved the way for the fall of the Berlin Wall three months later. The open Hungarian border with Austria allowed hundreds of people to leave communist Eastern Europe. The event was called the "Pan-European Picnic". Mrs Merkel, who grew up in East Germany, thanked Hungarians for their "courage and foresight". "What Hungarians did here was very brave," she said at a commemoration event. "Two enslaved nations together broke down the walls of enslavement... and Hungarians gave wings to East Germans' desire for freedom. 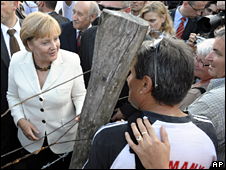 "The opening of the borders became irreversible and in a few months, the walls of the Cold War were razed," she added. On a wreath decorated with the German flag, was a single word "Danke", or "Thank-you". Hungary's President, Laszlo Solyom, meanwhile unveiled a white marble monument in memory of those who had risked their life to cross the Iron Curtain. Organisers of the "picnic" like Laszlo Nagy had wanted to highlight the division between East and West. They said they had not planned the outcome, but that it had exceeded their expectations. "The Soviet bloc was like an air balloon with over-pressure so it needed only a prick of the needle and we were holding this needle," Mr Nagy explained. "Honestly to say, if we wouldn't have organised this Pan-European Picnic, something would have happened two weeks later, three weeks later, because the politicians needed a trigger." The BBC's Oana Lungescu, at the Hungarian border town of Sopron, says the system had already begun to crumble. Poland had just elected the first non-communist prime minister in 40 years. Hungary's reformist Prime Minister Miklos Nemeth had started dismantling the security fence along its border with Austria, partly because it cost too much. In September, Mr Nemeth fully opened the borders, allowing some 60,000 East German refugees to leave for the West. None of this would have been possible without the tacit approval of Soviet leader Mikhail Gorbachev, our correspondent says. One of those who fled into Austria was Robert Breitner. Speaking in Sopron, he said the event had changed his life. "This land brought me freedom. In a symbolic sense this country opened the doors to freedom, to life decisions. And for that I will be grateful to the Hungarians for the rest of my life." Swedish Foreign Minister Carl Bildt, who was in Sopron with Mrs Merkel on behalf of the EU, recalled the watchtowers and the barbed wire he had once seen crossing the border there, our correspondent says. But he also urged today's Europe, weary of further expansion, to continue welcoming new members, just as it admitted the countries of the former communist bloc, she adds. "We must remain an open Europe of open societies and open minds, open to others beyond our present boundaries," Mr Bildt said.